After an 8-year-old girl fell into a panda enclosure on Saturday, the Chengdu Research Base of Giant Panda Breeding in Sichuan Province issued a warning: Pandas are not as meek and docile as they appear. Pandas are potentially dangerous animals, and even their keepers must keep their distance once the animals turn 2 years old, it said. Visitors are required to stay in the designated safety zone. 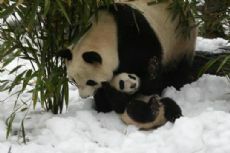 A video of the incident showed a crowd of people watching five pandas in their enclosure. The video appears to show the girl climbing the fence herself and being accidentally knocked from her perch, falling into a dry ditch on the animals' side. The ditch, which is more than 2 meters deep, serves as a barrier between the pandas and people. About 20 seconds later, a curious panda slowly walked to the edge of the ditch and looked down at the girl, arousing screams and warning shouts from the crowd behind the fence. Liu Guihua, a guide, clambered over the fence to a ledge above the ditch and tried to pull the girl out with a bamboo pole normally used for collecting rubbish. The effort failed. Meanwhile, a second panda wandered over to see what was going on. As a third panda approached the ditch for a look, Liu abandoned the pole and reached his arm as far down as possible, as others held his feet to prevent him from falling in. This time he managed to reach the girl with a hand and pulled her up, losing his cap in the process. The terrified girl was then reunited with her parents. After sending the girl to the base clinic for an initial physical examination, employees sent her to a hospital for further examination, Liu said. Zhou Mengqi, a 66-year-old photographer from Chengdu who has photographed pandas since primary school, said the animals are not as docile as they appear. He recalled taking pictures of a panda eating bamboo at the base one day in the early 1990s when the animal suddenly charged him. He said a claw touched his trousers before he escaped through a gate. A woman from Hong Kong was not so lucky when she entered a panda den at the China Research and Conservation Center for the Giant Panda in Wenchuan county, Sichuan, in the summer of 2005. The panda attacked her and bloodied her arm with its claws.